383 Beacon is located on the south side of Beacon, between Fairfield and Gloucester, with 381 Beacon to the east and 385 Beacon to the west. 383 Beacon was designed by architect Frederick B. Pope and built ca. 1869, one of ten contiguous houses built as five symmetrical pairs (377-379-381-383-385-387-389-391-393-395 Beacon), each house on an 18 foot wide lot and each pair united by a shared portico. 377-379 Beacon are one story higher than the other four pairs, and probably were built that way (they appear as such on the 1887 Sanborn map). Click here for an index to the deeds for 383 Beacon. On October 1, 1869, 383 Beacon was purchased from George Gibson by Rev. Thomas Baldwin Thayer. He and his wife, Sarah A. (Harris) Peck Thayer, made it their home. Rev. Thayer was a retired Universalist clergyman. He has served as minister of the First Universalist Society in Lowell and then as minister of the Shawmut Universalist church in Boston. He edited The Universalist Quarterly from 1864 to 1886 and was the author of The Theology of Universalism, published in 1862. Sarah Thayer died in August of 1871, and he moved soon thereafter. On September 29, 1871, 383 Beacon was purchased from Thomas Thayer by Mary Augusta (French) Roberts, the wife of hide and leather dealer James Adams Roberts. They previously had lived at 11 Newbury. They also maintained a home in Andover. On August 30, 1883, Mary Roberts transferred 383 Beacon to her brother-in-law, George Lucian Davis of North Andover (George Davis was the husband of James Roberts’s sister, Harriet Kneeland (Roberts) Davis). During the 1883-1884 winter season, the Robertses were living elsewhere and 383 Beacon was the home of William R. Caulkins and his wife, Julia A. (Wurzbach) Caulkins. By the 1884-1885 season, they had moved to Auburndale and the Robertses were living at 383 Beacon once again. James Roberts died in July of 1885. 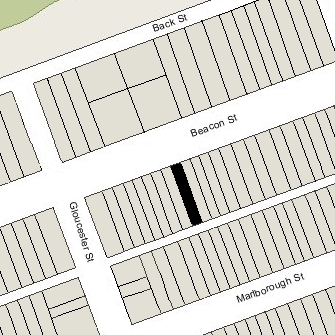 Mary Roberts continued to live at 383 Beacon during the 1885-1886 winter season, but then moved elsewhere, probably to Andover (where she died in February of 1893). On October 19, 1886, George Davis transferred 383 Beacon back to Mary Roberts. During the 1886-1887 winter season, 383 Beacon was the home of Edmund Dana Barbour, a railroad executive and former shipping merchant in the China trade, and his wife, Mary Therese (Ross) Barbour. 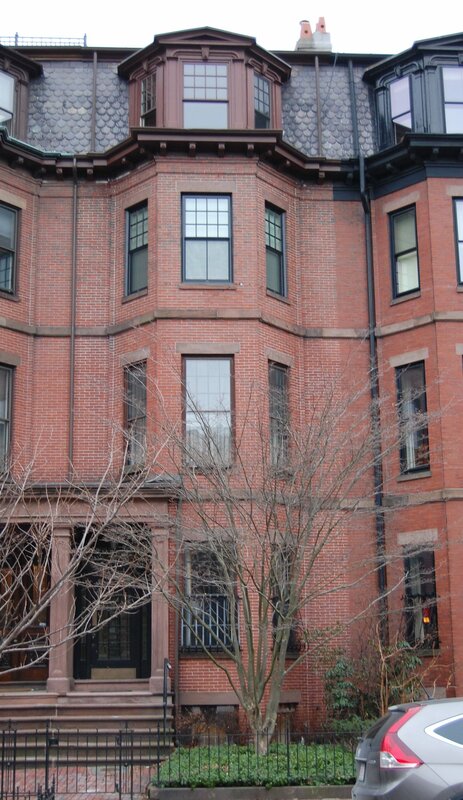 Their primary residence was in Sharon (in the mid-1890s they would acquire a Boston home at 344 Beacon). By the 1887-1888 winter season, 383 Beacon was the home of James and Mary Roberts’s son and daughter-in-law, Edwards Roberts and Beatrice (Fernald) Roberts. In the early 1880s, Edwards Roberts had traveled to the west, where he was a correspondent for several publications, served as editor of the Colorado Springs Gazette in 1881, and wrote several books on western subjects. After their marriage in June of 1886 in Santa Barbara, California, he and his wife lived in Boston and he became an investor in street railway systems. They continued to live at 383 Beacon during the 1888-1889 season, but moved thereafter. On March 18, 1889, 383 Beacon was purchased from Mary Roberts by Charles Loring Jackson. He was an organic chemist and professor of chemistry at Harvard, credited as being one of the first organic chemists in the United States. Charles Jackson was joined at 383 Beacon by his parents, Patrick Tracy Jackson and Susan Mary (Loring) Jackson, and his unmarried siblings, Anna Pierce Jackson and Ernest Jackson, a teacher. They all previously had lived at 94 Pinckney. They also maintained a home in Beverly. Patrick Tracy was a cotton buyer and mill agent. He died in November of 1891 and Susan Jackson died in March of 1905. 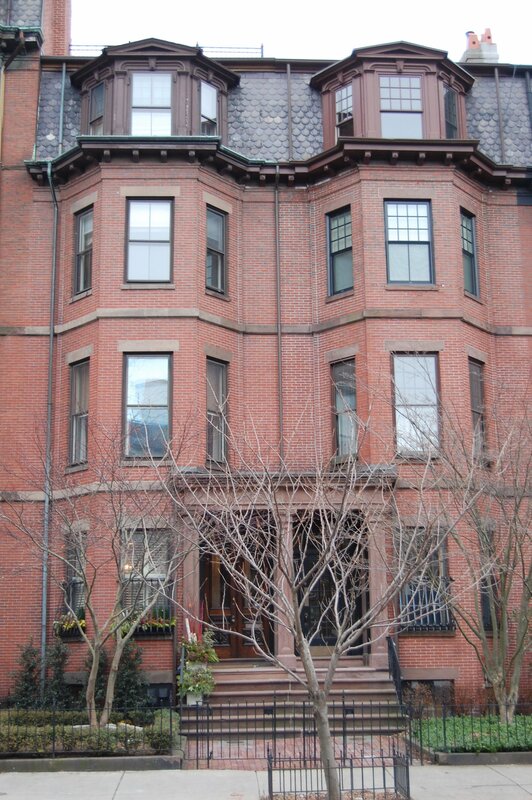 Charles, Anna, and Ernest Jackson continued to live at 383 Beacon. Ernest Jackson died in February of 1913, and Anna Jackson died in April of 1922. Charles Jackson continued to live at 383 Beacon until his death in October of 1935. He also maintained a home in Prides Crossing. On July 21, 1936, 383 Beacon was purchased from Charles Jackson’s estate by real estate dealer Henry Joseph O’Meara. On October 15, 1936, 383 Beacon was acquired from her by Joseph Corman, a building contractor, as trustee of the Mason Trust. That same month, he filed for (and subsequently received) permission to convert the property from a single family dwelling into four apartments. In November of 1936, he amended the filing to increase the number of units from four to five. On April 10, 1959, Joseph Corman transferred 383 Beacon to his daughter, Anne (Corman) Adler, the wife of Julius Adler, who was the sole beneficiary under the Mason Trust. On April 13, 1959, she transferred the property back to him. The property changed hands and on August 31, 1970, was acquired by Joseph A. Spadafora. In August of 1971, he wrote the Building Department for clarification as to whether the legal occupancy was four apartments or five apartments, noting that he was in the process of transferring the title and wanted to remove this uncertainty. The Building Department confirmed that 383 Beacon’s legal occupancy was five units. On August 27, 1971, 383 Beacon was acquired from Joseph Spadafora by Emma F. Willman, who applied for (and subsequently received) permission to convert the property from five units into four. In August of 1979, Allan Ganem filed for (and subsequently received) permission to reduce the number of units to three, and on December 31, 1979, he amended the condominium master deed to reduce the number of units from four to three.